I have driven a lot in the past ten days. Literally thousands of miles up and down the major highways of the southeast and I have to admit, I am exhausted. As I was driving I began to take notice of how much time I spend looking in the rear view mirror to keep up with what’s going on behind me and to see where I have been. Most of us don’t really use our mirrors as much as we learned to in Driver’s Ed. Remember those classes when we would diligently look back every few moments so that we could drive defensively? It is really amazing what the image in the mirror, the reflection of what is behind us, can teach us. 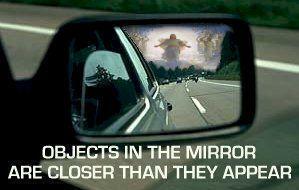 I am beginning to develop a deepening theology of the rear view mirror. That is hard for me to admit. I have always considered myself a leader and a leader constantly looks forward. We are always looking toward the horizon, trying to understand what the future holds and how we can best prepare for it. I am learning that the best way to prepare for the future is to learn from the past. Two things are certain: first, we rarely see God’s hand when we are in the middle of a struggle and God’s presence is right in front of us and, secondly God is most evident in the rear view mirror. When we are struggling with situations, decisions and the overwhelming challenges right in front of us we wonder where God is. How many times in my life was I in the middle of the toughest times and felt that God was no where to be found? During the past year being separated from my daughter, starting a new position with incredible challenges and moving 250 miles away from my family all took their toll. There were days when I thought I had been abandoned by God or that when I took this ministry over I had answered the wrong call. Maybe God got the wrong number? It has literally been just this week that I have really began to live into the fact that God has called me to this time and place to do a work that all that has gone before has lead me to. Looking back it seems so self-evident. God has been preparing me to be where I am. The people I have contact with, the resources I use, the things I’ve read all have converged to help me design ministries for youth, young adults and youth/young adult workers. Even having two progressive teen-agers who constantly challenge me to think differently help me grasp what their struggles and concerns are, under the surface. I can look in my spiritual rear view mirror and see how God has worked in the past year to break my old ways of thinking, acting and reacting and prepare me for a new level of ministry. God has prepared me for new relationships, new opportunities and is revealing a new vision that I would have never been ready for a year ago. Thanks be to God. o Reflection is important! Spending time thinking about where you have been allows you to be truly present in the here and now. Reflection can best be defined as seeking God’s presence in past circumstances. Listening to God’s whispers to you by God’s past actions. Reflection provides clarity. o Process the past. Processing the past keeps it from interfering with the future. If we fail to process the past, the doubts and fears of the past hold us back from living in the “now” and preparing for the future. Process out loud, in a journal, with a friend, but process. It is amazing what you will see once you look back with a searching eye. o Learn from the past. There are people in my life that repeat the same mistakes over and over again. Why? Because they fail to learn from the past. Reflecting is essential, processing is important, but until we learn from our past we can’t grow past it. Learn!